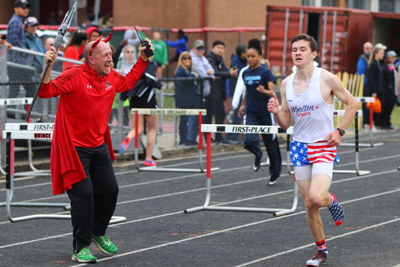 Every year, Quince Orchard head coach Seann Pelkey puts on his devil-horned headband and taunts dozens of runners who eventually get eliminated from the Devil Takes the Hindmost, the premier event at the QOHS Cougar Relays. 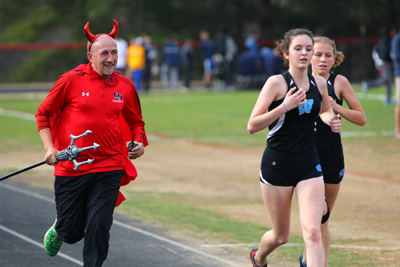 The race always ends with faux outrage on the part of Pelkey when one runner eventually wins the race and "eludes" the Devil. Pelkey's faux outrage was especially fitting for Wootton High School's John Riker when he broke away from the field while The Devil Went Down to Georgia blared over the stadium loudspeakers. Pelkey shook his trident and directed his ire towards "Johnny" Riker while the lyrics rang out: "The Devil bowed his head because he knew that he'd been beat, and he laid that golden fiddle on the ground at Johnny's feet." "Yeah, I really enjoyed it," said Riker. 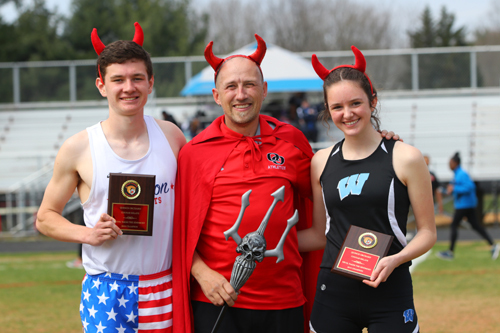 "I just really enjoyed Coach Pelkey playing the Devil at this event and it's just very fun. Definitely one of the most unique experiences I've had running." Riker said that he was too scared to run the Devil's race during his first three years of high school, but Wootton only entered this year's Cougar Relays meet so that a few boys, including Riker, could run that race. It was a worthwhile trip, as Riker broke away from the field with five laps to go and completed 21 laps (approximately 5.25 miles) in 28:13. 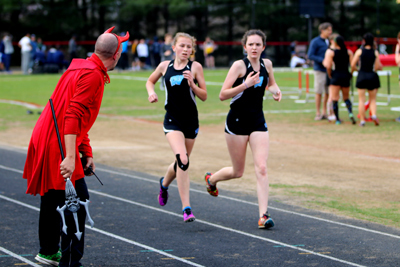 Whitman High School's Alicia Lauwers was not so keen on the Devil's taunts. The negativity, no matter how playful, was not helpful to her, but she admitted that the Devil did offset his teasing with occasional words of encouragement. "I think sometimes it wasn't good for me because it kind of put me down," said Lauwers, "but at some point he was like, 'Oh yeah, she's going to be a three time champ.' So that helped me throughout the race." If she was affected by the Devil, it was not apparent in her racing from the last three years and it will not deter her from entering the race again next year. Lauwers became the first ever three-time Devil Takes the Hindmost champion at the Cougar Relays and she wants to be the first to win four. "It's exciting," said Lauwers. "I'm really happy about it. Hopefully I can get a fourth time. That would be really good." What was her key to success? Well, she wanted to hang back and let others lead, but nobody else would take charge of the race. She advanced to the front of the pack almost immediately, settled into a comfortable pace, and was never really challenged except by her teammate Emmersen Weinberg who matched her every stride. "I was expecting my teammate [Weinberg] to be there, but she didn't really expect it..." said Lauwers, "but it was really surprising at the end how we just fought to the end." After 20 laps in 32:08 (approximately five miles), Weinberg and Lauwers crossed the finish line together. Lauwers was awarded the win by way of a judge's call. There were no cameras used by the meet timers. Whitman head coach, Steve Hays, said that he did not want to watch the finish, but he said that he was not surprised to see Weinberg match Lauwers stride-for-stride. The gap between the two closed during the indoor track season and early this outdoor season. Hays expects Weinberg may be even more dangerous next year while Lauwers attempts her four-peat. 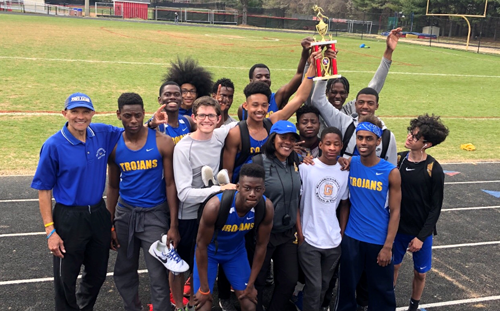 The Gaithersburg boys won the meet with 97 points. South Carroll claimed the girls title with 73. Richard Montgomery's Garrett Suhr won the boys mile in 4:27.8. Gaithersburg's Freddie Oke won the boys 300-meter hurdles in 40.1. Gaithersburg's Zachary Jones was second in 40.7. Gaithersburg's boys won the 4x110 shuttle hurdle relay, 4x100, 4x200, 4x400, 4x800, and high jump relay. Gaithersburg's K.C. Ashiogwu triple jumped 36-10.